A robot chef was cooking octopus balls autonomously at the Osaka Museum of creative industries last month. The device was created by Toyo Riki of Japan. The food-savvy automaton wears a towel twisted rakishly over its upper module. The octopus balls are made individually, each one carefully made from scratch. The octopus balls are made in thirds; the cooking delicacy must be hand-turned after each portion cooks to add the next bit of dough, creating a perfect octopus ball. The final steps include putting the octopus balls on a plate, basting each one with sauce, and shaking on some spices. 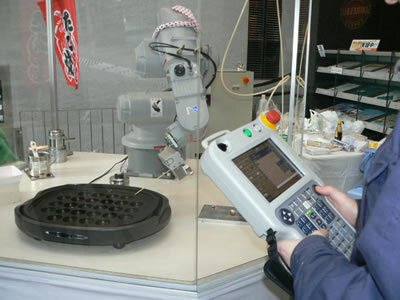 The purpose of the demonstration is not to create a finished robot chef product, but to demonstrate robotic capabilities. As far as I'm concerned, though, these treats look ready to eat. Bring on the robot chefs! Cooking robots (or automated cooks) are under serious development; read about the AIC-CI Cookingrobot Chinese Robotic Chef. And while you're at it, you might want to line up some robot waiters.